"Thanks again for all of your help getting us the ladder. Our guys love it!" "This product is cutting edge technology brought to the law enforcement tactical arena. The potential versatility through accessorizing the base model makes this a multi tool must have for all tactical teams. The Syracuse Police Department Emergency Response Team is honored to assist in helping to bring this product to our brother tactical operators." "The ladder is extremely light and easily transported to locations as needed. Training was completed transporting the ladder in its storage bag and then assembling it at a jump off point. One person can easily carry the ladder and have hands free to provide cover or carry other equipment. Assembly was quick, quiet and simple. Training was also completed transporting the ladder assembled. Again one person was able to easily carry the ladder, but his hands were not free for other tasks. 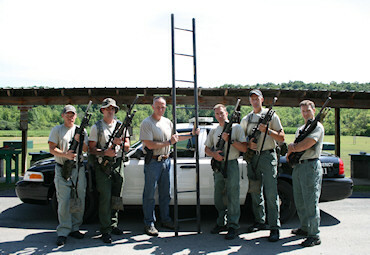 The Carbon Fiber ladder is a very light weight and sturdy tool. It is versatile and quiet making it usefull for tactical situations." "The ladder is rated for 350 lbs but can easily hold well over that. For one test we placed the assembled ladder horizontally between two weight benches. We then placed a total of five operators, over 1000 lbs, on the ladder. The ladder did visibly bow, but it held together without breaking. Careful examination afterward, particularly at the joints, did not reveal any stress cracks or other signs of failure anywhere. Even though this is not the type of load application this ladder is designed to withstand it gave us an indication of just how strong it is. I feel very confident in stating that in a near vertical position this ladder would be able to hold as many operators as could physically fit on it. One of the best features of this ladder, aside from its lightweight design, is the fact that it can be used in individual sections or combinations of sections. This can be advantageous when conducting window entries and bus assaults."